Also joining the partypoker ranks are Patrick Tardif, Travis Darroch & Ryan Schoonbaert - all hailing from Canada. 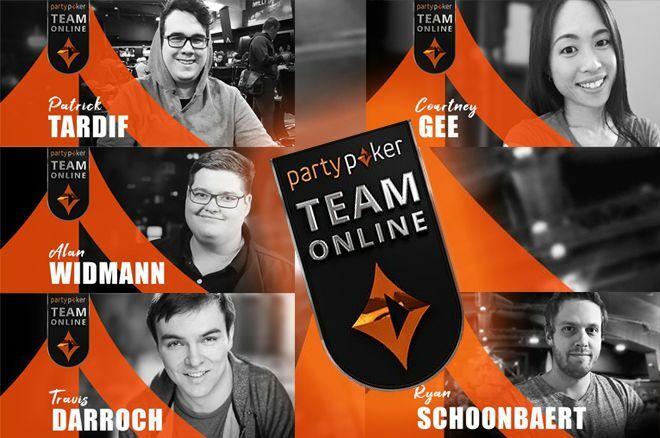 Last Monday, partypoker announced the formation of a team of streamers that will represent the online poker brand via the Twitch streaming platform. The first two to join Team Online were Matt Staples and Hristivoje Pavlovic or “ALLinPav,” and they have been followed with five additions thus far. Last week, Travis Darroch, Patrick Tardif, and Alan “Hotted” Widmann joined. Ryan Schoonbaert's sponsorship was announced on Monday and now the latest - Courtney "courtiebee" Gee becomes an official member of partypoker Team Online. Canada is being strongly represented on partypoker Team Online, Travis Darroch being the second Canadian to join the squad after Staples. An aspiring actor turned poker streamer, Darroch gets to combine his two passions in front of the camera on stream. You can find Darroch by his screenname “rookie1609x” and watch him stream on his Twitch channel: dramaticdegen. A former professional gamer, Alan “Hotted” Widmann has made the transition to poker player while staying true to his gamer roots. Widmann has amassed quite the following, with over 286,000 followers on Twitch alone. Before joining up with partypoker, Widmann was a Unibet Open ambassador for Unibet Poker for two years. He will now be streaming his partypoker exploits under the screenname “aawc89” on his channel, Hotted89. Yet another Canadian on the stream team is Ryan Schoonbaert. Viewers can find Schoonbaert playing a variety of poker formats under the screenname “RSchoonbaert.” The Canadian poker pro got his start in the live arena playing $1/2 to $5/10 NLH and PLO, and according to his Twitch page he’s “trying to make the transition into online NLH, PLO and O8 MTTs and will be here to stream the journey!” If you’re looking for some game variety, he could be a good member of Team Online to watch at his Twitch channel RSchoonbaert. A Canadian native, Courtney Gee streams from Vancouver, Canada, playing under her nickname "courtiebee." The University of British Colombia graduate has been streaming poker for four years, building her "swarm" of more than 37,000 followers. After starting out playing 6-person and 18-person sit 'n' go's, Gee made the switch to heads-up hypers, and now streams mostly MTTs. In perhaps a bit of foreshadowing, just last Saturday Gee got heads-up in the partypoker $55 buy-in $15K guaranteed Main Event with partypoker's Matt Staples. They battled for nearly an hour and after some back and forth, Gee got the victory for a $2,985 payday. Just a few days later, she joined Staples in the partypoker stable. You can watch her stream at her channel, courtiebee. How Many Blackjack Variants Do You Know? Estamos na semi final da @DreamHackBR , amanhã vai ser #DiaDeFuria total!! !